Time flies and it's September now! I can't imagine that there are actually few days left to the end of my internship journey! It was a tough journey, definitely. I have to sit and work all day. Even though sitting under the air-conditional environment for around 7 hours long within these few months, I have realized that my skin wasn't drying! 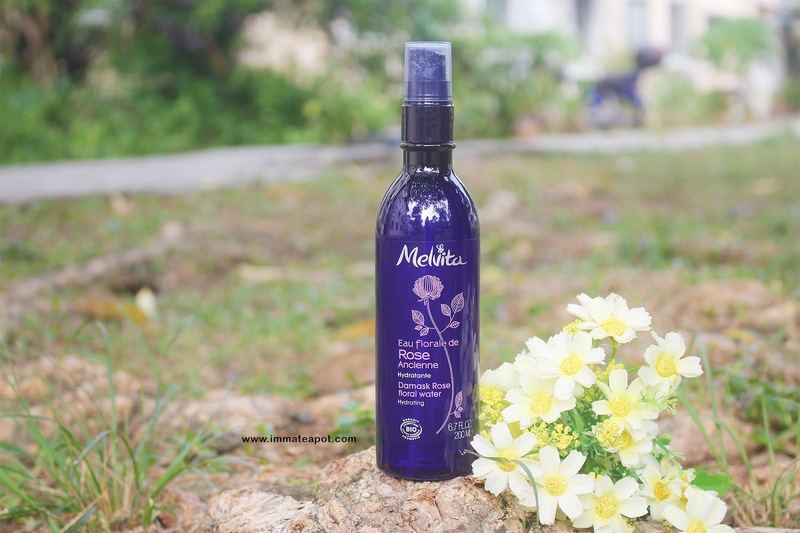 The secret of keeping my skin hydrated all the time - Melvita Rose Floral Water! I'm a truly floral lover and I am glad that I have discovered this Rose Floral Water from Melvita few months back! I am loving it now to the bit and it has become my daily obsession! Reading the formulation and ingredients panel on the packaging, I was so surprised that the floral water is actually obtained through steam distillation of fresh rose petals, where the unique extraction method get to obtain floral water which is highly rich in active ingredients. All the ingredients' extracts are fresh and organic, of course the main component is Rosa Damascena Flower (Damask Rose). In only a bottle of Rose Floral Water, it contains over 2000 Damask Rose Petals! Like the usual spring water, it comes in a pump-kind bottle where the spray nozzle helps to fully control the amount of the mist as well as the area covered, vertically. In 2 pumps, it got my face all covered! Melvita Rose Floral Water has become one of my favorite spring water, I just can't stop loving the scent of the rose mist, so refreshing and delicate. I definitely enjoy every single moment during the application, with the rose aroma fully spread in the air. I love using the Rose Floral Water as toner, for day and night! 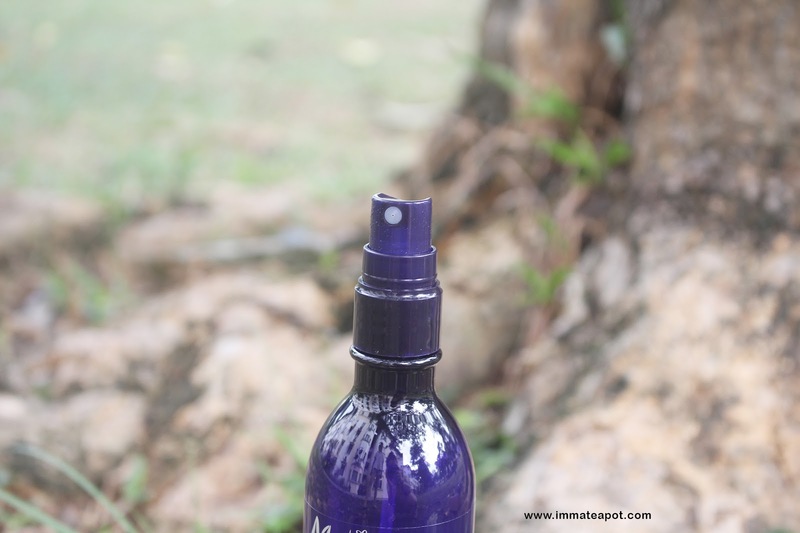 I can feel the cooling sensation on my skin, it is soothing and my skin is hydrated in just a spray. If you are a rose lover or even a frequent spring water user, I bet you will love Melvita Roe Floral Water! Just like I do! It looks so convenient and easy to use. Just spray and skin will be more hydrated!!! shud try it out as my skin quite dry one. anyway, nice photo ! Have not heard of this brand before but since I am looking for a spray like that, I might just try this. Besides, I love floral scent, too! The one that I'm using is just normal spring water which doesn't have any smell! Really wish to try this product with rose scent! I like to use mist product! It can be really convenient to use and bring around too =D Didn't know that this Melvita Rose floral water comes in mist packaging. I am sure it must be very cooling and soothing. Would love to try. I have been using Melvita Rose Floral water for many years. I love the refreshing feeling and the lovely rose scent. I love this floral mist also, it so soothing. love something with floral taste and moisturizing as well. will definitely check it out as i also sit in office for 8 hours a day 5 days per week. Nice! Do you pat it in after spraying? I love this product!! I have a small bottle that I carry with me!